It is not the usual point of view by which a tourist might expect from a particular destination. 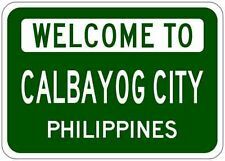 That is not to say that Calbayog City and Samar province do not possess awe-inspiring vistas, endowments from Mother Nature, and comfortable visitor facilities.In fact, they do. And outstanding hospitality, I might emphatically add.We have more than an ample share of such bounties. These have always been there, undiscovered by heretofore scant stream of visitors; almost inert and unminded by potential local business interests; and developmental prospects even taken for granted by local gentry. Welcome change has, however, crept in. Change is now in vibrant crescendo. Observing, seeing and feeling such a third world community rising to meet the opportunities and challenges of economic growth, partaking and enjoying 21st century accoutrements has its own particular tourist allure. It is an altogether different visitor point of view that I will hazard to say is in need of calibrated promotions both by local government as well as by the dominant commercial interests. Indeed, it becomes better and best when a pleasure trip is mixed with a search for venues of investment, for new business opportunities, and for retirement relocations. It is to be noted that new wealth created in and for the Calbayog community was spurred by entrepreneurs who some fifty years ago were pioneering risk-taking new comers, themselves. There is still much more that awaits the bold and the imaginative entrepreneur. Calbayog and the province fronting the western coast of Samar island are now in readiness, offering economic opportunities to investors and managers of businesses in search of new wealth. My annual pilgrimage to the good old, beloved hometown and home grounds (usually exclusively devoted to visiting kin and recharging emotional batteries) has failed to give due notice to the sights and sounds of pulsating commerce. This time around, however, pieces of evidence abound that are truly unmistakable. They all spell P-R-O-G-R-E-S-S ! You simply cannot miss them. All of a sudden, hotels and inns are opening for business. Both in town and in resort areas. These are sure signs of an in flow of visitor interest. For international tourist grade accommodations, there is the seaside ‘Ciriaco,’ and the smaller, recently opened BayPark. Both equipped for conferences as well. For a seaside retreat and hideaway, there is the seven-suite Coral Reef Resort (Barangay Ba-ay) about 25 kilometers north of Calbayog proper. Another venue to watch out for is a small natural cove, some half a kilometer wide endowed with a pebble beach and crystal clear waters. This in Barangay Ba-ot, under construction. I regard Ba-ot to be superior to Punta Baluarte in Calatagan, Batangas, which I have frequented in the past long, long ago.